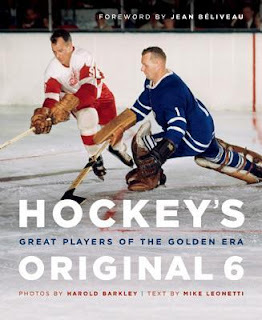 Hockey Book Reviews.com: Hockey's Original Six by Mike Leonetti with Howard Barkley. Hockey's Original Six by Mike Leonetti with Howard Barkley. The Original Six are hot these days. The Bruins and Blackhawks have won the last two Stanley Cups. The Red Wings are the class of hockey in recent years. Montreal and Toronto always have undying support, and quietly the Rangers are one of hockey's better teams right now. That makes for a great time for a book about hockey's glory days when these six teams were the only ones around. Enter Hockey's Original 6 . Written by Mike Leonetti, the book really is a beautiful showcase of the late Howard Barkley's hockey photography. Here's more from the publisher: "The hockey stars of the 1950s and '60s—Rocket Richard, Gordie Howe, Dave Keon, Bobby Hull, Jean Beliveau, Terry Sawchuk, Tim Horton, and others—were some of the most passionate players in National Hockey League history. These skillful and often colorful athletes played exhilarating hockey and were national heroes in a time when only six teams and fewer than 150 players battled for the Stanley Cup. "Hockey's Original Six celebrates the most dynamic players and exciting moments of the era in more than 120 photographs from the legendary Harold Barkley Archives, including a number of never—or rarely seen—images. From 1942 until the early '70s, Barkley was the Toronto Star's leading sports photographer. He pioneered the use of electronic flash to capture stop-action hockey, and his dramatic work—both black and white and vibrant color—define the pre-expansion period. "Two informative essays by Mike Leonetti-hockey historian, archivist, and prolific sportswriter—set Barkley and the photos in context, and short image captions illuminate the players and their feats. Jean Béliveau—hockey legend and elder statesman—provides a personal and insightful foreword. Combining iconic images and hockey lore, Hockey's Original Six is the perfect gift for sports fans, history buffs, and art collectors." In many ways this book is a re-presentation of Leonetti's 1998 release HOCKEY'S GOLDEN ERA: Stars of the Original Six . That book featured brief biographies of each featured player, whereas this new release does not. That's okay though, as Barkley's photos are stunning show-stealers. Leonetti's captions wonderfully compliment the photos. Jean Beliveau writes the foreword rather than Frank Selke, Jr.
All in all, a beautiful book that promotes hockey history. You know I like that. Good review. My Father's name is Harold..not Howard Barkley. Some of the photos used were our family's.